Beauty Guides: All About Marsala Makeup...!!! Hope you are doing great. Pantone has selected MARSALA as the color of this year, 2015. Marsala is a gorgeous bold and deep shade. It is a lovely reddish brown shade or should I say a muted wine shade with some touch of brown in it. This shade will compliment many skin tones. I personally love this shade a lot and think its perfect for Asian skin tones. Therefore today's post is dedicated to the color of the year i.e. Marsala. 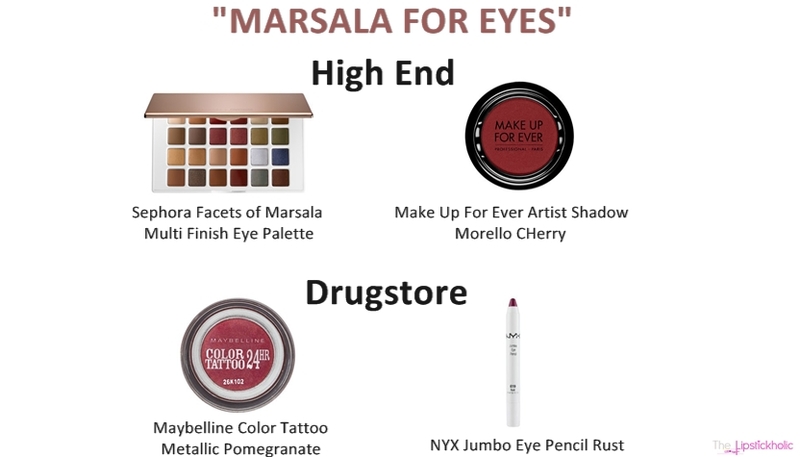 The credit of this post goes to the sweetest ever Umaima of Dudettes Talk as she basically came up with this idea to do a collaborative post on "Marsala Makeup & Fashion Guide". 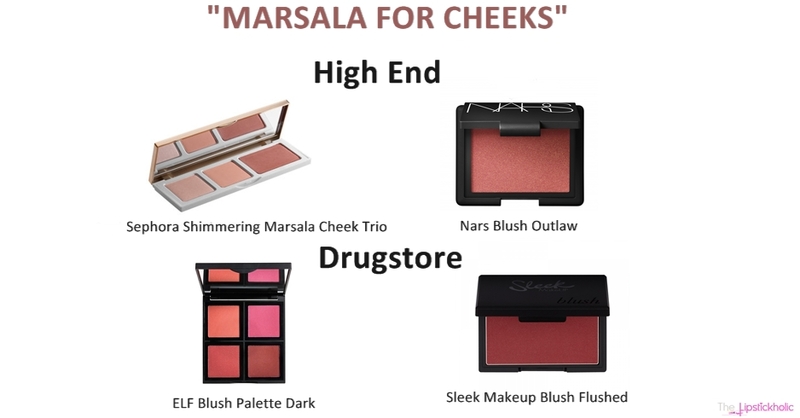 Therefore am sharing with you this Marsala Makeup Guide today. 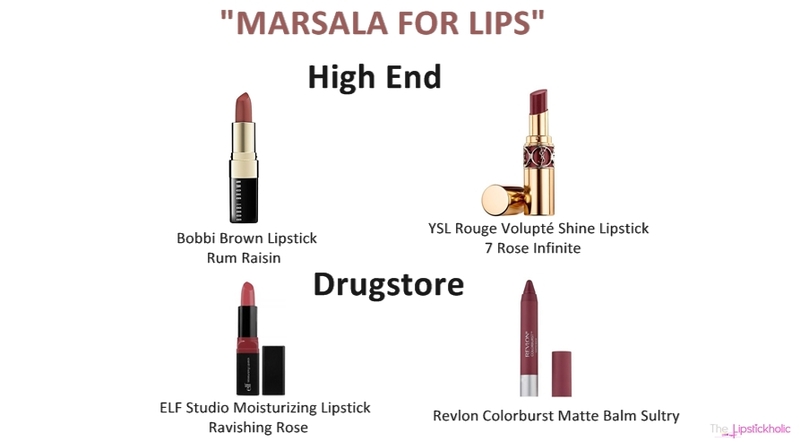 I hope this post will help you in buying the right Marsala makeup products this year (both from drugstore & high end brands). Marsala is such a lovely shade that would so compliment brown, hazel and green eyes. My high end picks of Marsala eyeshadows include Sephora Facets of Marsala Multi Finish Eye Palette ($39). This was a limited edition palette that went out of stock at Sephora so quickly but is still available at Ebay and few other websites. My second high end Marsala eyeshadow recommendation is Make Up Forever Artist Shadow in shade Morello Cherry ($21). My drugstore Marsala picks for eyes are Maybelline Color Tattoo in shade Metallic Pomegranate (£4.99) and NYX Jumboo Eye Pencil in Rust ($4.50). This is my favorite section of all. There are so many lovely Marsala lipsticks that I have on my wish list for this year. Am sharing just a few with you. My Marsala high end lipsticks recommendations are Bobbi Brown Lipstick in Rum Raisin ($26) and YSL Rouge Volupte Shine Lipstick in Rose Infinite ($35). MAC "Sin" is also a beautiful deep Marsala lip color. Its actually quite darker than the actual Marsala shade. If you are a budget buyer then the best drugstore options are ELF Moisturizing Lipstick in Ravishing Rose ($3) and Revlon Colorburst Matte Balm in Sultry ($7.19). Another great drugstore Marsala lipstick is Essence long lasting lipstick in "On The Cat Walk". And there are plenty of lovely Marsala lip colors to share with you but to keep it short I have listed just few of my favorite shades here. Again for high end brands Sephora takes the lead here. Sephora's Shimmering Marsala Cheek Trio ($28) has to be on the top. It is such a gorgeous palette with three beautiful shades. It was again a limited edition palette which is not available at Sephora now but u can still find it at Ebay for almost ($50). My second high end recommendation is Nars Blush in shade Outlaw ($30). As for budget buyers, the best Marsala blushers are ELF Studio Blush Palette in shade Dark ($6) and Sleek Blush in shade Flushed ($6.99). I love these two shades and have these on my wishlist especially the sleek blusher, it is so gorgeous. Now time to paint your nails Marsala. The high end suggestions in this section are Chanel Le Vernis Nail Color 18 Rouge Noir (£18) and Tom Ford Nail Lacquer Bordeaux Lust ($32). Drugstore lovers should check out Essie Nail Color in shade Thigh High ($8.50) and INGLOT O2M Breathable Nail Color #625 (Rs 1250/- almost $13). That's all for my Marsala makeup guide. I hope you find this post helpful. But wait...the post hasn't ended yet. To spice up your wardrobe with Marsala, read Umaima's Marsala fashion and dressing guide on her blog here. Disclaimer: The makeup images used in this post are taken from Google. For further information read my complete Disclaimer & PR Policy. This set has almost all the basic must-have brushes on should have. The brushes come with white handles. They are very soft and good quality. I really like these brushes especially the eye brushes included in the set. The blending brushes really do the job well and are my favorite. Overall, the set is great value for money. If you haven't tried Sigma Beauty brushes yet, you should definitely get this limited edition brush set as it contains perfect combination of eye and face brushes. 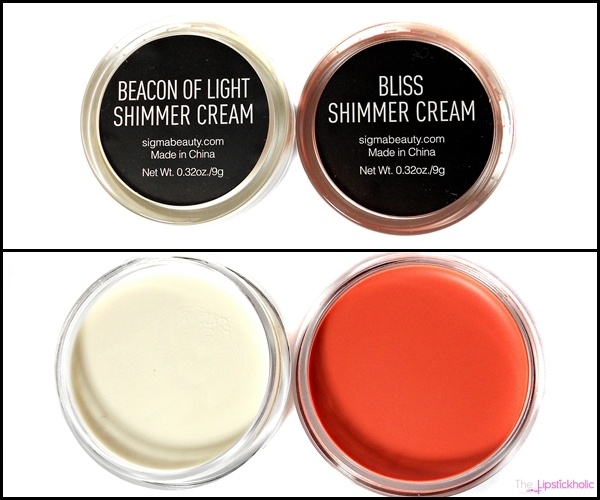 The two shimmer creams included in the set are "Beacon of Light" which is white in color and "Bliss" which is a coral peachy shade. These can be worn anywhere on face. I like to use these as blushers. To be honest, I was slightly disappointed with the shade beacon of light as it didn't actually showed up on my skin after blending. It added no shine or no color. However the other shade bliss is amazing. Its a lovely peachy coral shade which will look good on almost any skin tone. I love using it as a cream blusher on my cheekbones. 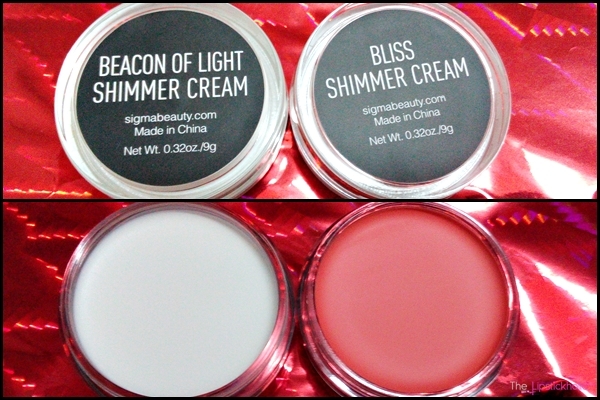 Both the shimmer creams blend very easily and provide a nice luminous finish. Sigma Beauty Euphoria Lip Base is my favorite product from the entire collection. It is a hot pink shade with some hint of fuchsia. It is very pigmented and is so creamy. It glides smoothly on lips, doesn't enhance any lip cracks and provides velvety semi-matte finish. I am so in love with this lip base and would love to try more soon. The staying power of this lip base is pretty impressive too and it lasts on me for about 5-6 hours (with a full greasy meal). I definitely recommend you to try these lip bases by Sigma Beauty. These sure are worth-buying. The Flip Flop Lip Switch from this collection is another very captivating product. The lip switches of this collection are holographic and that is what makes them look very unique. The shade Flip Flop is a nice orange shade with holographic finish. Despite having holographic finish, it is still very wearable. This lip gloss is paraben-free and it feels light weight and moisturizing on lips. The actual color of the lip switch fades after about 2-3 hours but it even after that it leaves your lips feeling hydrated for some extra couple of hours. 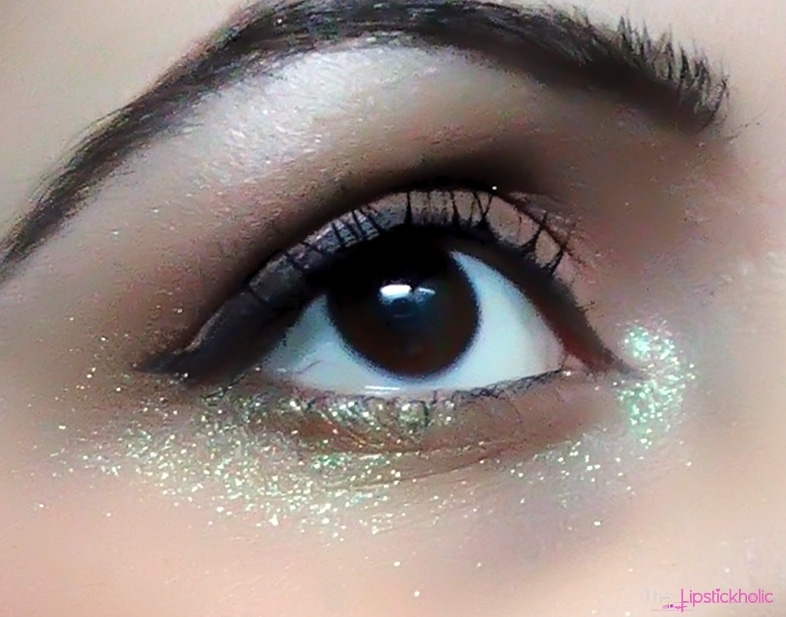 These glitter and shimmers can be used anywhere. 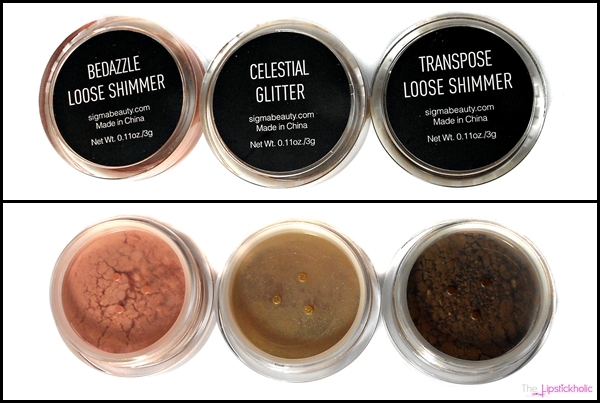 You can use these on your cheek bones, on lips, on hair or can also use these as eyeshadows. I tried using them everywhere on my face. I used the pink shade on my cheeks as a nice pinkish highlighter. I also used these on my eyes to create a subtle yet glamorous look. I also used the glitter on my lips using the lip switch as base for it. Overall, these are really fun to use. I really love the celestial gold green glitter and the bedazzle shimmer. Sigma Beauty Ethereal Radiance Collection Loose Shimmer & Glitter Set "Abracadabra"
At the end here is a quick subtle "Ice Mermaid" eye look that I created using the loose shimmers & glitter set "Abracadabra" from this collection. Overall, I am in love with this ethereal radiance collection. It is amazing and I really like all the products that I have tried so far especially the brush set, the lip switch, lip base and shimmers & glitter set. I will be using the brushes I got in this ethereal radiance collection set to create and share more eye makeup looks with you. 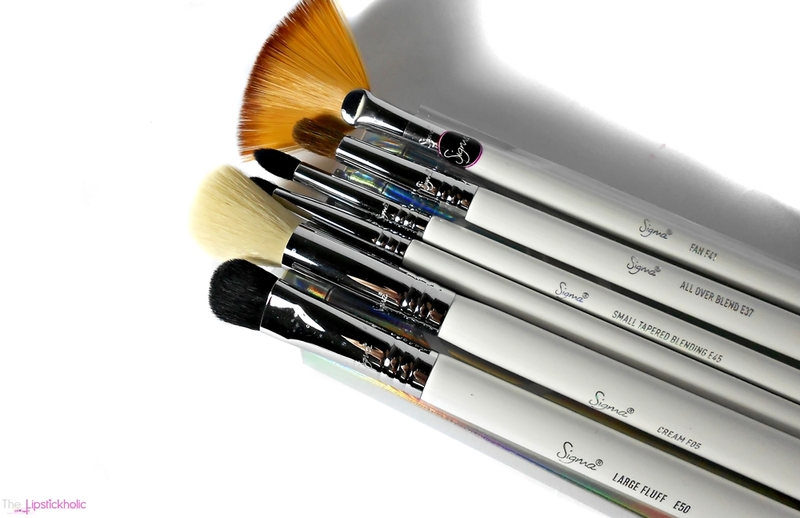 Price & Availability: The Sigma Brush Ethereal Radiance Collection is available online at Sigma Beauty website here. The ethereal radiance brush set is priced at $76, the lip bases at $12 each, the lip switches at $14 each, the shimmer creams at $16 each and the loose shimmer and glitter set cost $30 each. Have you tried anything from Sigma Beauty Ethereal Radiance Collection...??? Don't forget to leave your comments and tell what you think of this collection. Weekly Asks: What Makeup Brushes/Tools You Use Most Often...??? What makeup brushes/tools you use very often...??? My Ans: My answer to this would be blusher brush, kabuki face brush (to apply foundation) and a buffer brush. These are the brushes that I use the most. Previously I used to prefer applying foundation with fingers or sponge for routine days, but now I have become habitual of applying foundation with brushes too. I still don't use tools like lash curlers or eye brushes so often though. Don't forget to share what makeup brushes/tools you use most often in your comments below. 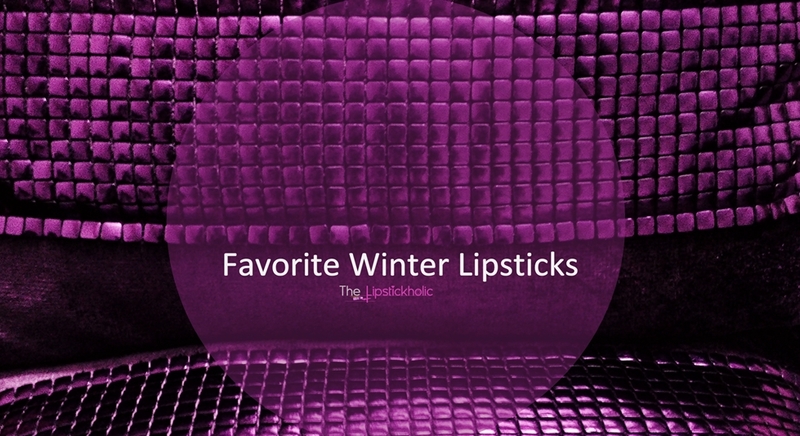 My Top 5 Favorite Winter Lipsticks...!!! 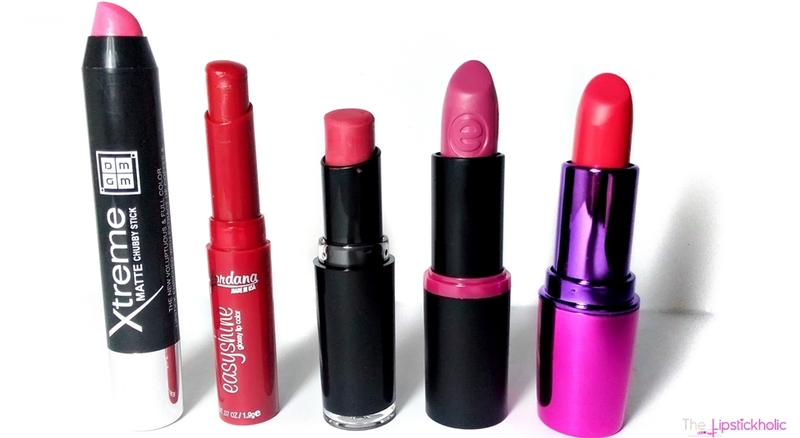 Okay so these are my favorite lipsticks for winters. There are many other shades I love for this season but these are the ones that I have been wearing a lot lately. I am totally loving these shades and these are perfect for winters. Here are the swatches of all the shades. It's a beautiful blue based pink. I am a lip crayon/chubby sticks lover and this has to be one of my favorite lip crayons. 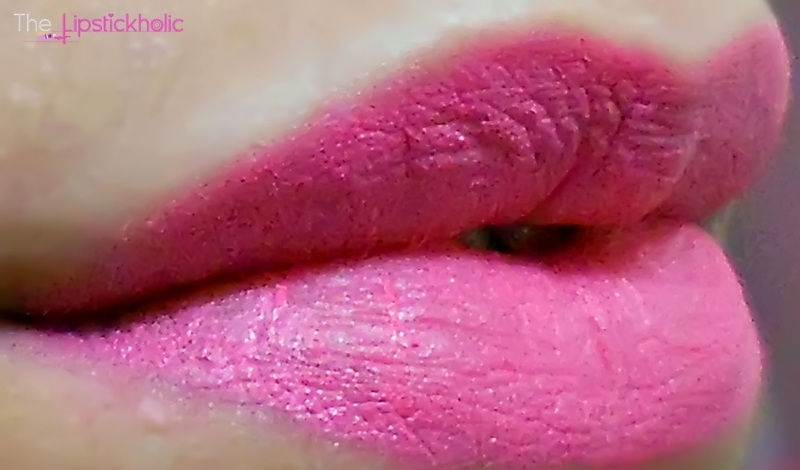 I love pinks and this is such a beautiful pink shade and has the perfect velvety matte finish. I have reviewed this shade on my blog. For further details read full review here. 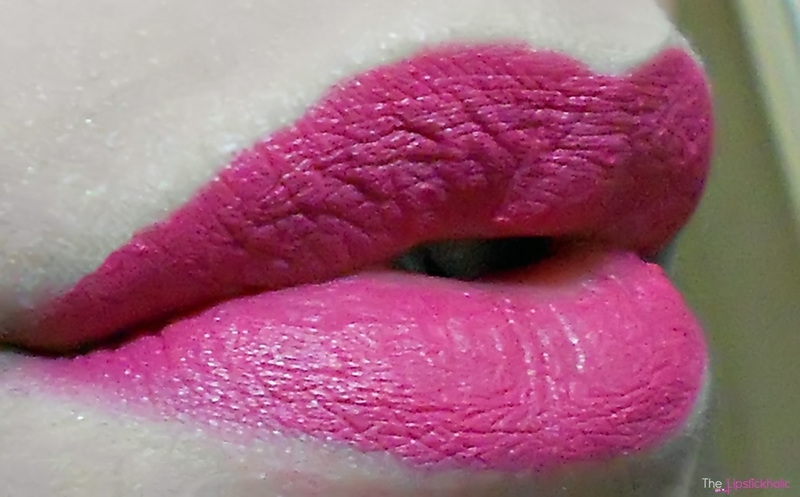 Here is the lip swatch of this lovely shade. DMGM Xtreme Matte Chubby Stick in shade "Wax Apple"
2- Jordana Easy Shine Glossy Lip Color in shade "Sweet Strawberry":I don't usually wear bold reds very often but this is a sheer red kinda lip color. Therefore it is my favorite red lip color for casual use. It is hydrating which makes it perfect for winters. It is a very wearable red shade and can be worn anytime without looking over the top. I have already reviewed this lip color on my blog and you can read the full review here. Jordana Easy Shine Glossy Lip Color in shade "Sweet Strawberry"
3- Wet n Wild Mega Last Lip Color in shade "906D Wine Room":I bought this one just about a week ago and am already in love with this shade. Its such a lovely deep burgundy kinda shade with some hint of brown. Its a bold but wearable shade with great staying power. I don't know if its actually a Marsala toned lipstick, which is the Pantone color of the year (2015). But somehow on my lips it appears close enough. Therefore I can call it my first Marsala lipstick. Wet n Wild Mega Last Lip Color in shade "906D Wine Room"
Essence long lasting lipsticks are my favorite budget lipsticks available in Pakistan. They are so creamy, moisturizing and have decent staying power too. Wear Berries is a lovely purplish shade. Its a very wearable purple, a perfect shade for fall/winters. Below you can essence see wear berries on my lips. Essence Long Lasting Lipstick in shade "Wear Berries"
Another lipstick that I got recently and I have fallen in love with it. Its a gorgeous pinkish red shade with some mild brown undertones. I love this shade so much and I have been wearing this lipstick a lot since the day I got it. It is hydrating, the color is lovely and it leaves a nice subtle stain. So this is my new lipstick love. I have already done a detailed review on this lipstick here. Makeup Revolution I Heart Makeup Lip Geek Lipstick in shade "Just Have Fun"
Sigma Affilate: My December Affiliate Challenge Prize...!!! Hope you all are doing great. 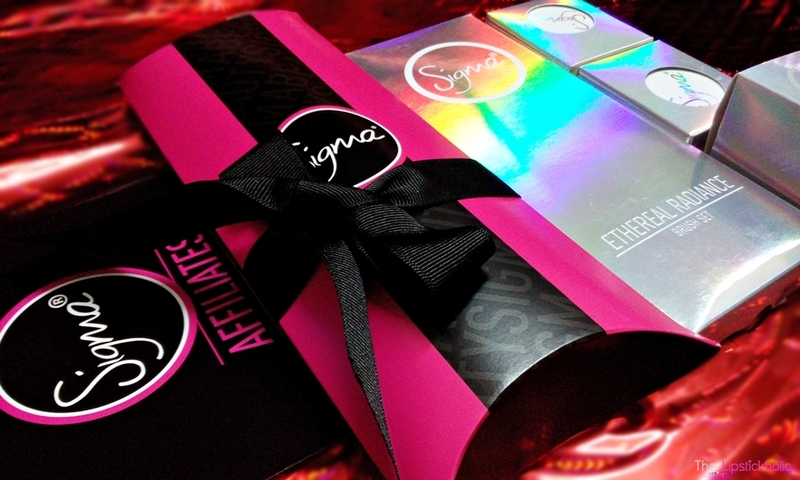 Last month Sigma Beauty organized a December Affiliate Challenge. It was a giveaway specifically for their affiliates. 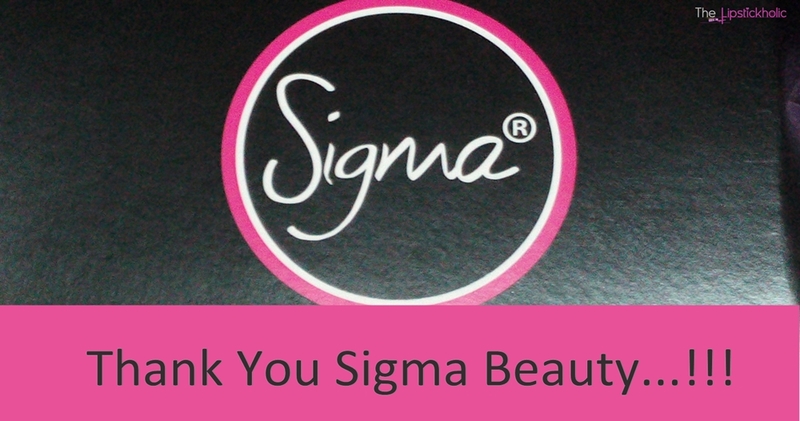 To participate in the giveaway, the affiliates were asked to share their favorite Sigma Beauty product launch of 2014. My answer to this question was "The Ethereal Radiance Collection". I find the whole theme of this collection very fascinating and magical and I just love it. Guess what, to my surprise on 1st of Jan, 2015 I was announced as the winner of this challenge on Twitter. OMG...I was so so sooo happy. Winning a Sigma Giveaway is like a dream come true. I contacted the Sigma Affiliate Program Coordinator, Kristina to claim my prize. She is so humble and always very supportive. I was even asked about my color preferences for products that I won from Ethereal Radiance Collection. My giveaway prize was shipped last week and I have been waiting for it to arrive eagerly day and night. Finally today I woke up to the best mail ever. Yes... I received my Sigma Beauty Affiliate December Challenge prize Alhamdulillah. 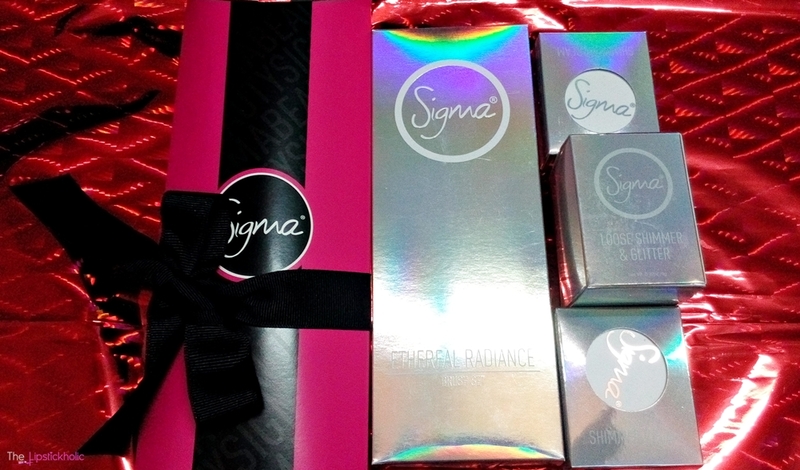 The package contained everything that I always wanted to get from Sigma Beauty. Am so thankful to Sigma Beauty and Kristina(their affiliate program coordinator) for arranging this wonderful December challenge for the affiliates. 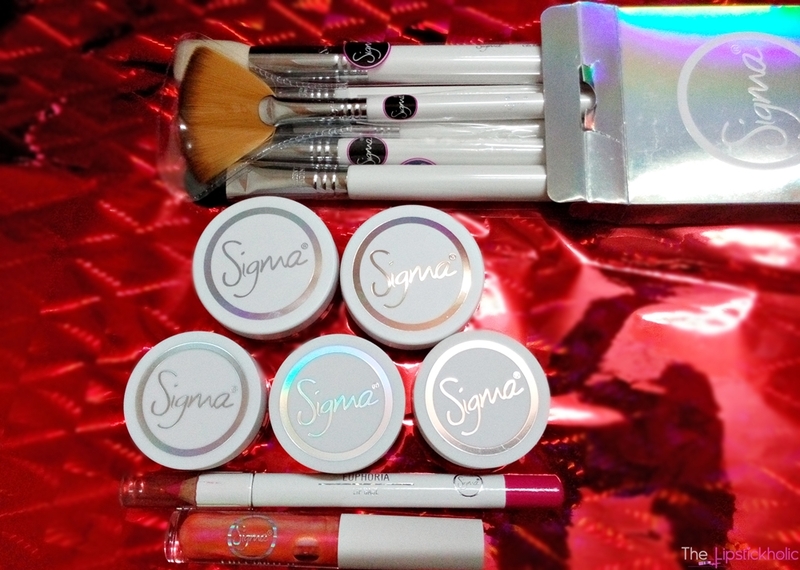 Let's take a look at what I won from Sigma Beauty in their December Affiliate Giveaway. Let's take a closer look at the things I got. Starting with the two famous 3DHD™ Brushes. Now hold your breath as am going to show you the fascinating ethereal radiance goodies that I got. Sigma Beauty Ethereal Radiance Collection Loose Shimmer and Glitter Set "Abracadabra"
Aren't these products just ah-mazinnnggggg, especially the ethereal radiance collection... <3 I am so in love with all the things I got. Now u must be wondering why haven't I shared any swatches. 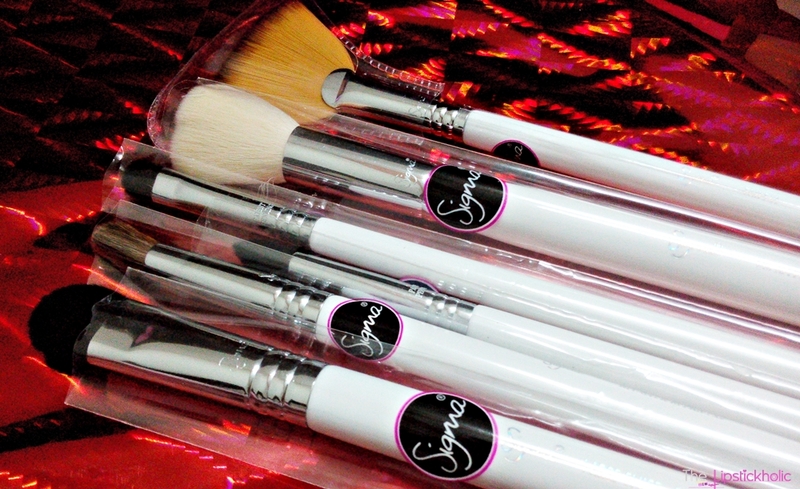 That's because I will be doing a detailed review on this collection and the 3DHD™ Brushes in a separate post soon IA. Once again thank you so much Sigma Beauty for this special Affiliate Giveaway. Am so happy to be a part of Sigma Beauty Affiliate Program. 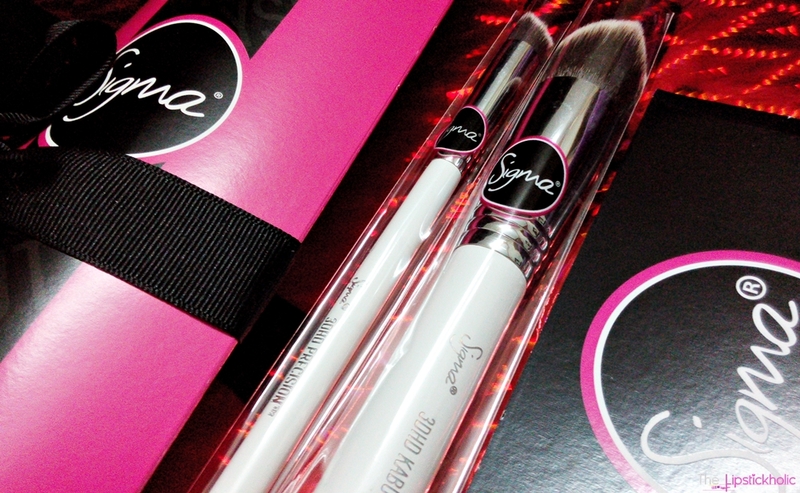 You can get the Sigma Beauty Ethereal Radiance Collection products and the 3DHD™ Brushes from Sigma Beauty Website. Have you tried anything from Sigma Beauty Ethereal Radiance Collection...??? Don't forget to leave your lovely comments. Weekly Asks: Bold Eyes or Bold Lips...??? I hope you all are doing well. This weekend I have another interesting question to post in my Weekly Asks Segment. While doing makeup, do you like to put emphasis on your eyes or you like to make a statement by wearing bold lipsticks...??? My Ans: Bold Lips it is...!!! I usually don't do a lot of eye makeup. For my eyes, I just like to wear a nice black eye liner and sometimes a very subtle eye shade too, nothing too dramatic though. And yes, I usually prefer wearing bold and bright lip colors and let my lips do the talking. So am more of a "Bold Lips" kinda girl. Okay so I have already expressed how much I adore the packaging of these lipsticks. 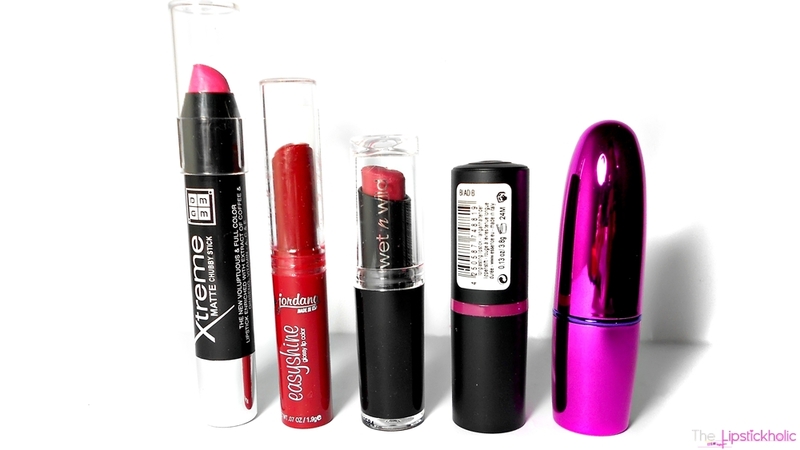 These lipsticks come in metallic bullet tube which is bright pink from outside and half blue and half pink from inside. The packaging is really classy yet glamorous. It doesn't feel or look cheap at all. The only downside of such packaging is that it is prone to finger prints. But that's not a major issue. I bought this lipstick in two shades "Happy Girl" and "Just Have Fun". 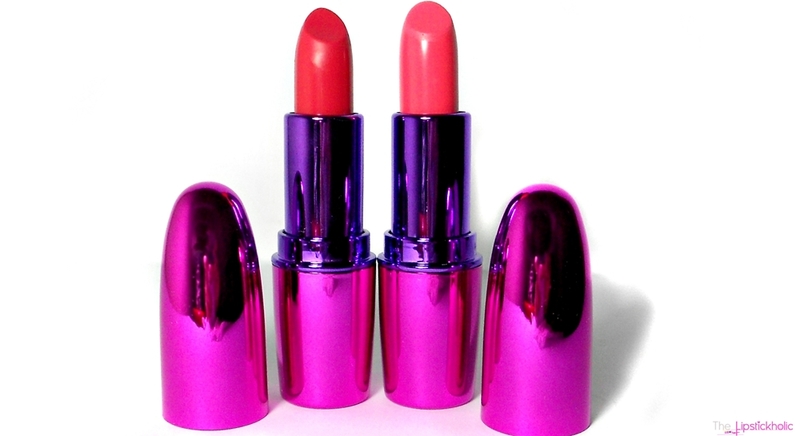 The texture of these lipsticks is very very creamy and that's why these glide smoothly on lips. They have kinda buttery texture and feel moisturizing on lips.The finish of these lipsticks is creamy. Therefore, these lipsticks have slight tendency to bleed. I love the texture and feel of these lipsticks and love the fact that these do not feel drying on my lips. My experience with both the shades was slightly different so I will be sharing it individually below. The shade "Happy Girl" is shade is a light pinky coral shade. Its looking much lighter and pale in the picture below but it actually appears as a nice wearable barbie pink shade. This shade has decent pigmentation and the coverage it provides is sheer to medium. What I don't like about this shade is that after about an hour of application, it accentuates fine lines on lips. It also has slight tendency to settle in fine lines and lip cracks, not a lot though. The staying power of this shade is about 2-3 hour (with minimal eating and drinking) after that the actual color fades and it leaves a nice pinkish stain which lasts for 2 more hours which isn't very bad for the price. The second shade I got is "Just Have Fun" which is a nice pinkish red shade with some mild brown undertones. I so love this shade and its perfect for winters. This shade is more pigmented and the coverage it provides is medium yet buildable. The finish is creamy again but slightly more glossy. This shade feels more moisturizing and doesn't accentuate any fine lines on my lips. The staying power of this lipstick is pretty decent too. It lasts on my lips for about 3 hours. After about 2-3 hours of application, it starts looking like a subtle red lip stain and gives the impression of those naturally red lips. I really love that natural red lip look. The stain lasts for some extra couple of hours. So the overall staying power of this lipstick is almost 4-5 hours or more which is pretty good for a drugstore lipstick. Overall I love these lipsticks. The lighter shade didn't perform very well for me but I still like the shade and its perfect for spring/summers. "Just Have fun" has to be my favorite among the two as its more pigmented, offers better coverage and doesn't accentuate any fine lines or cracks on my lips. Both the shades make my lips appear fuller and feel really moisturizing. And yes the names sound happy too :D At the end here are both the shades swatched on my arm. Price & Availability: These lipsticks are available at Facebook page Makeup Therapy for Rs 650/- to 750/- only. Internationally these are available online at Makeup Revolution Online for £2.99 to £1.99 only. Have you tried Makeup Revolution Lip Geek Lipsticks...??? What do u think about these...??? Don't forget to leave your lovely comments. Hope you all are enjoying your days. I shopped from many new Facebook pages and websites during past 2 months and I hope to share my thoughts on those with you. One of the pages I recently discovered is "RTW Creation". 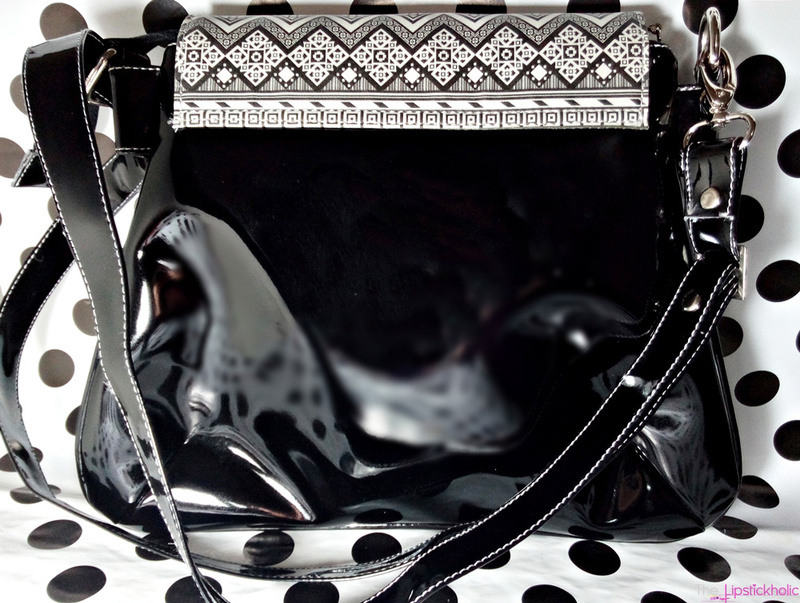 It's an online store selling handbags, clutches, jewellery and other fashion accessories. Last month they were having a great sale at their website/page. 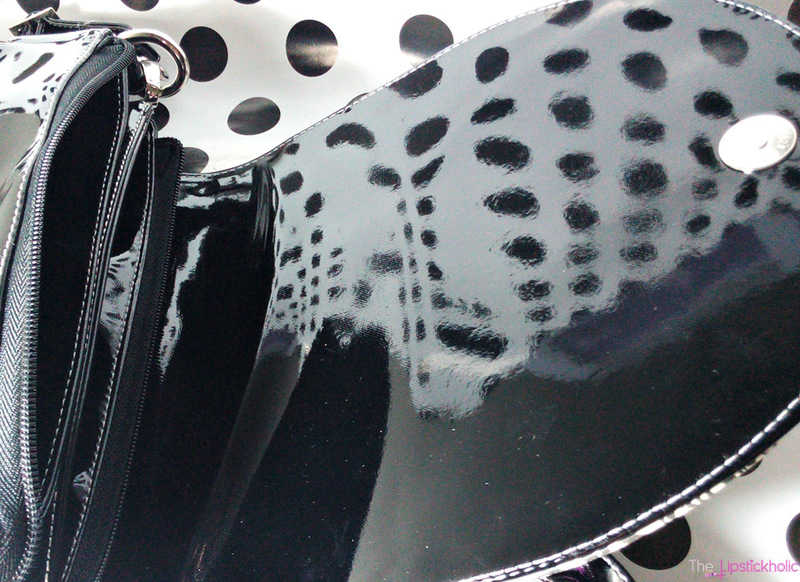 That's when I decided to gift myself a new black trendy bag from their online store. So let's take a closer look at the bag that I got and my shopping with this new store. During the last week of December 2014, I came across this Facebook page RTW Creation. At that time the page was having a grand sale and was offering up to 50% off on all their bags and accessories to celebrate the launch of their very own website. It was a great offer for all bag lovers like me so I visited their website and browsed their collection of handbags, clutches and other accessories. What I found special about their bags, laptop sleeves and clutches was the special Aztec print. 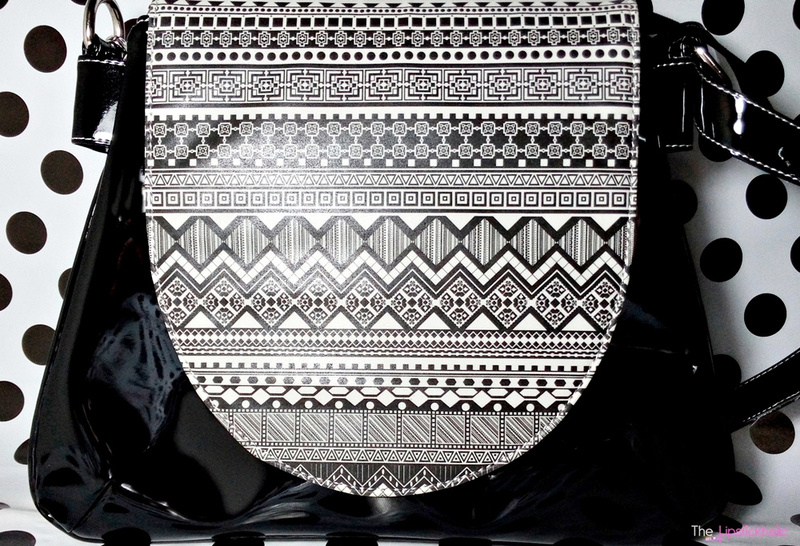 There were so many good bags and clutches available at such reasonable rates but this black bag with grey and white Aztec print grabbed my attention. So I finally decided to buy this for myself. Placing order at their site is super easy. All you have to do is add your favorite items to the cart and then fill out the form with your name and shipping details and you are done. Their main mode of payment is COD (Cash on Delivery) which is very convenient for most of the buyers. For some reason, I didn't want to chose COD and wanted to pay via bank transfer so I dropped a message at their Facebook page regarding this. I got a reply from them very soon (in about an hour) telling that I can also chose to pay via bank transfer. Therefore, I submitted my order as per their instruction and told them about it at their Facebook page. They again responded quickly and shared their bank details with me. This lovely bag costed me Rs 1245/- only (including shipping) during sale. I payed for my order in advance, told them about it and finally my order was confirmed. The same day I received a message from them at Facebook that my order has been shipped and it will be reaching my place in 1-3 days. I got my order in just 2 days and I was really impressed with their super fast delivery. My bag was properly wrapped. When I opened the packaging, I was really glad to see the quality of bag. It looked exactly like it was shown in the pictures on their website. The grey and white Aztec print is what really makes it look unique. 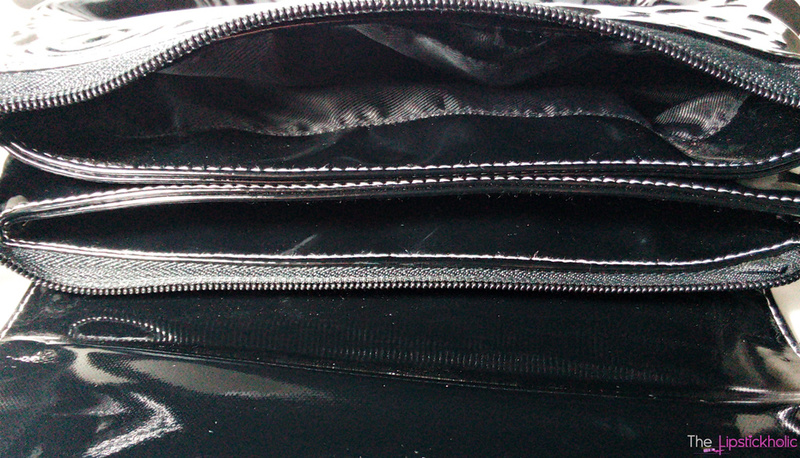 The bag has two main pockets inside and their is a small inner pocket too. It has a long detachable strap. The strap is adjustable and you can adjust its length according to your liking. I like to keep it short though. The bag is spacious enough to carry a lot of essential things. Its perfect for traveling or for casual use. It is good for university use too but is not big enough to carry your books. 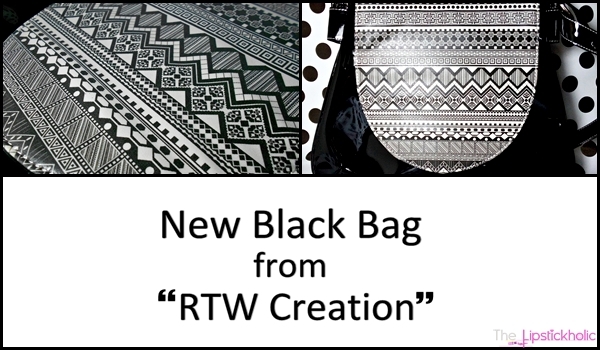 Overall, am highly satisfied with the quality of this bag and had a great shopping experience with RTW Creation. This bag is great for casual use and am glad I bought it. Its perfect especially for girls like me who always like to carry a lot of things in their bags. I always carry a lot of stuff in my handbag including a mini brush, few makeup items, a note pad, pen, sunglasses and much much more. This bag has all the space I need in my perfect bag. If you are looking for affordable yet trendy hand bags, jewellery, printed laptop sleeves or other accessories then you should check out this website rtwcreation.com. They have a nice variety of hand bags, chic clutches, lovely jewellery and much more. Don't forget to like their Facebook page RTW Creation to stay updated with their latest collection and other special offers. Tag Post: The Makeup Addiction Tag...!!! Sigma Beauty January 10% Discount Code...!! !